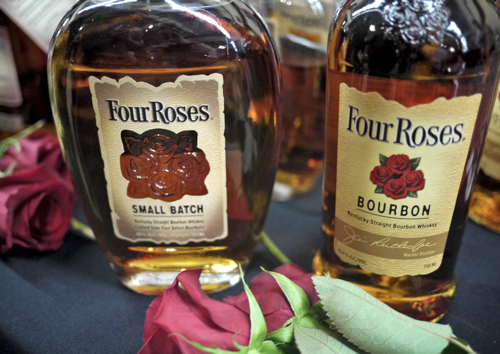 Four Roses is one of the hottest Bourbon brands in America, and if you didn’t know any better, you might assume that it has been this way for a long time. But for master distiller Jim Rutledge and the Lawrenceburg, Kentucky-based Four Roses team, the path to success has been rocky, and the climb to the top has only been recent. 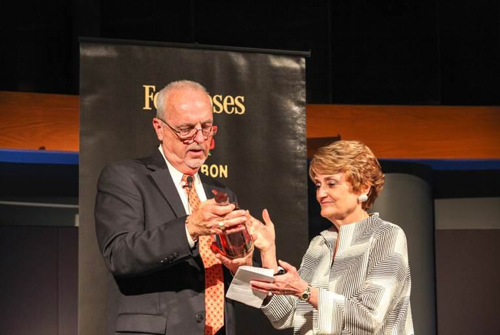 “September will be 10 years,” said Rutledge about the launch of the company’s iconic Four Roses Single Barrel. “In one way it’s hard to believe that it has been 10 years already. And in the other it has gone by in a heartbeat.” The launch of Single Barrel symbolized the beginning of the distillery’s road back to American prominence. 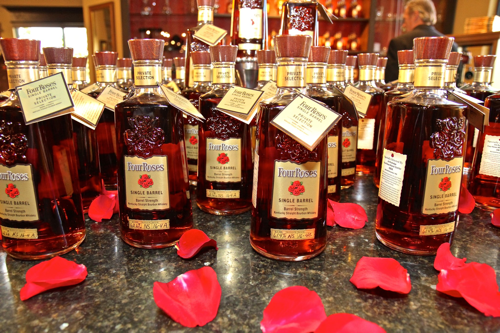 It set them on an innovative course that made Bourbon consumers realize that Four Roses was, in fact, one of the best. I caught up with Rutledge for a short interview at Julio’s Go Whiskey Weekend, just a few weeks ago. He spoke proudly about the company and their recent successes, including getting named Whisky Distiller of the Year for the past three years by Whisky Magazine. As always, Jim’s southern drawl and extensive history in the industry showed a side of Bourbon that you don’t always get to see so close up. 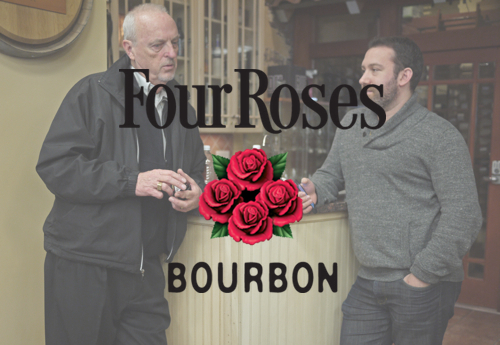 If you’re familiar with the Four Roses story, you know that the brand has gone through a number of ownership changes, dating back to 1943, when the company was first purchased by Seagram. Seagram took the brand through some unfortunate times, in which product quality dipped, focus on the American market faded, and faith in the brand collapsed. 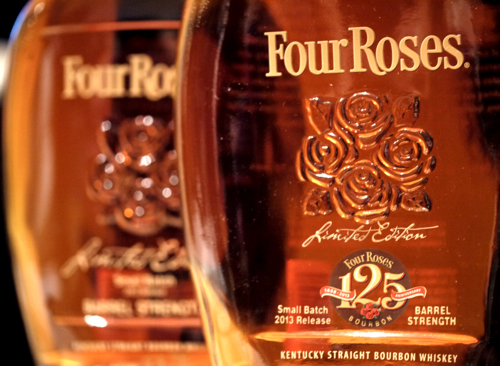 But, under the new ownership of Kirin (starting in 2002), Four Roses was given the freedom to pursue a new path. One that set it back on the right track, with Rutledge at the helm and good Bourbon on the horizon. Jim’s point about Bourbon stocks is something that has been a factor across the board for the industry. Not many distilleries predicted the upward shift in demand that was about to take place. But couple the overall industry demands with a ridiculous spike in brand demand, and you’ve really got to give Four Roses credit for being able to navigate the waters. 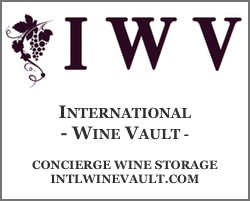 And, if I may say so myself, they’ve done so with finesse and while maintaining some of the true essence of what has built them – like, for instance, their private barrel program. Which leads one to wonder… with the pace of demand continuing to accelerate can Four Roses continue with programs like their private barrel selections? Speaking of these truly unique, one-of-a-kind selections, Four Roses has also built up quite a following around its annual limited edition releases. Last year’s 2013 125th Anniversary Small Batch, and its 2012 predecessor both won Whisky Advocate’s American Whiskey of the Year. I was one of the many critics that gave both of these truly remarkable whiskeys glowing reviews. The demand, however, and the limited availability nature of these annual releases (combined with the accolades) have turned these whiskeys into hot commodities on the market. Finding the 125th Anniversary Small Batch last year in retail was nearly impossible. This is a trend we’re seeing with other highly sought after brands like Pappy Van Winkle and the Buffalo Trace Antique Collection as well. “Doesn’t make any difference what my feelings are,” smiled Rutledge, letting off a little laugh. “I thought it was crazy… the second day after we introduced it [the 125th Anniversary Small Batch release], the bottles that first hit the market in Kentucky were selling on the internet for double, triple the value. As far as feelings… it was already going for higher than we’ve ever charged because the demand was so great… And then people are willing to pay that much! I guess it’s just a fact of any market that is built off of supply and demand. And producers, like Jim Rutledge, sit idly by and watch this after-market take shape. At the end of the day, there’s really nothing they can do about it. Just ask Julian Van Winkle… or Vinnie Cilurzo at Russian River Brewing. That said, all of this hype – and all of these accolades – is bound to cause some added pressure, one might presume. Having to do it year after year, continuing to one-up yourself… or even just stay at the same level. It’s a heavy ask. “You’re always trying to compete with yourself… trying to get better,” said Rutledge. “But that doesn’t mean that you get discouraged if you can’t… because things like that don’t happen all the time. Both of those whiskeys were what I would consider the best Bourbon I’ve ever tasted… Compared to last year, it’s going to be hard to beat. 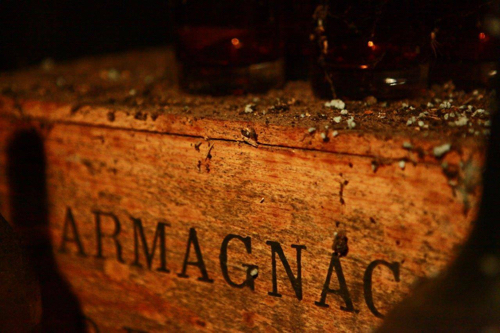 Of course, the whiskey market is continuing to grow into uncharted waters. More people are drinking whiskey, and the number of distillers in the US (and around the world) is growing at a steady rate. Consumers are being offered a much more diverse line of products than they’ve ever seen before. All of these market factors beg the question, what will the near future look like for Four Roses and the rest of the Boubon industry as more craft players enter the market? And to that point, I say, I think it’s good as well. 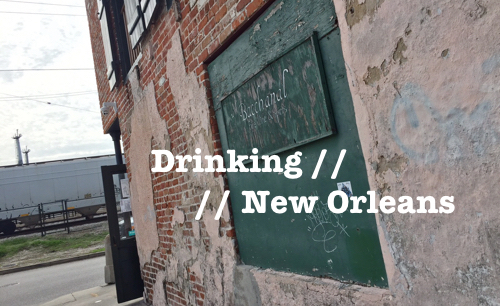 The growth of the Bourbon industry, the American craft industry, Four Roses… it’s exciting! And I’m glad that there are guys like Jim Rutledge who are still around to bring a long history of perspective to the table. It’s going to be a major asset to the inevitable changes that the whiskey industry will face in the coming years. Cheers to Jim Rutledge for his time, and to my pal Corey Bunnewith for setting up the interview. 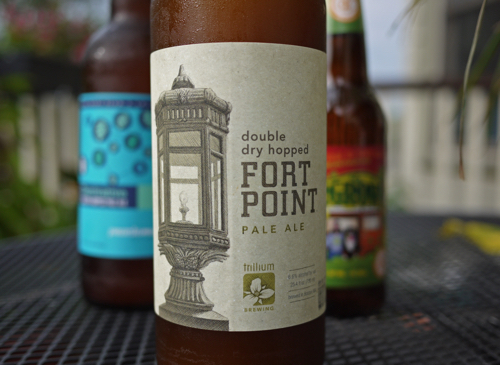 Previous ArticleSpring is in Session: Which Session IPAs Make the Cut? Great post. Jim doesn’t look very happy to be talking with you in the picture, haha. But you’ve got to love him, straight and to the point, not a lot of BS, and not to mention the fact that he’s making a killer product. The 2012 SmB and the 125th are indeed among some of the best bourbons I’ve ever tried. Did he mention when the 2014 LE Single Barrel is coming out? haha… he was deep in thought 🙂 He didn’t specifically mention when the 2014 LESiB is coming out, but i would assume around the same time it usually comes out in the Spring. Mr. Rutlage said Kentucky bourbon has a “long, long way to go” compared to Scotch (in terms of sales volume) but at the risk of disagreeing with the gentleman, I don’t think the way is as long as it may seem. We have folks from almost every country in the world visiting our website looking for Kentucky bourbon, including Four Roses. Myself, I’ve tried hard to get my hands on some FR125 but now even the secondary market has it at a premium. So hard to get it is, there are only 4 or 5 offerings at any given time available by private sellers on our site. Thank you for a great article and interview, DI.